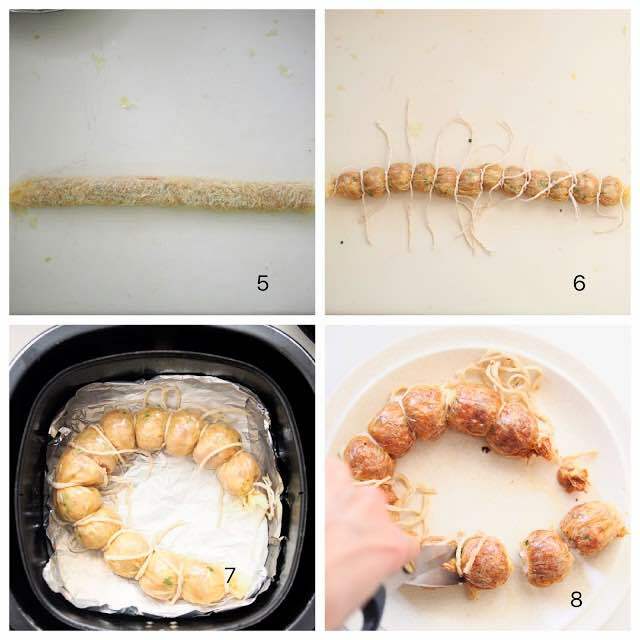 I made this healthy version of Prawn Rolls for our family’s early reunion last weekend. I used the air-fryer instead of deep frying. The way I prepared it is slightly different from the traditional way. The traditional method is to first steam before deep frying the rolls. I tried this first but found that it dried the filling a little too much. I tried it again with my own method and no steaming and it works much better for an air-fryer. These Prawn Rolls are a delicious! I wish everyone Gong Xi Fa Chai and Happy Chinese New Year 2018! Mix all the filling and seasoning ingredients in a large bowl until thoroughly mixed. Set aside in the fridge for one hour or you may use straight away. Wipe both sides bean curd skin with slightly damp cloth. Place the bean curd skin (10 X 16 inches) on table top. Brush some whisked egg on top and both sites edges of the bean curd skin. 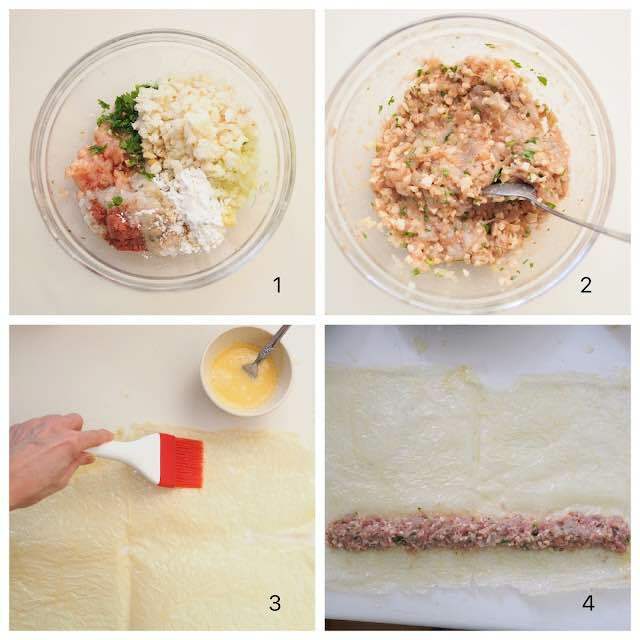 Place the filling in the lower half of the bean curd skin. Roll up the sheet like spring roll to form a log. Using the cotton twine tie the both ends, then tie segment by segment about 1 inch apart. Repeat the same to the remaining bean curd skin (5 X 8 inches). Rub the prawn roll evenly with vegetable oil. Arrange the prawn rolls on the Philips Airfryer wire basket and fry at 160°C for 10 minutes. 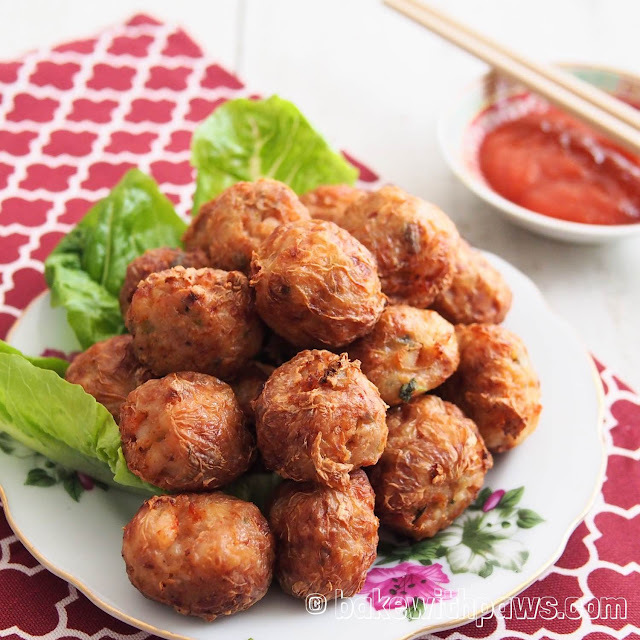 Remove the half cooked prawn rolls from Airfryer. Cut each segment with scissor and remove the string. Rub with some oil if the rolls are too dry. Put back all the prawn rolls into the Airfryer and continue to fry for another 5 to 10 minutes at 160C until golden brown and cook. I normally layer the Airfryer wire basket with aluminium foil for easy cleaning. But, it is optional. The roll will only stay crispy while warm.